Salli Terri - "Clyde Gilmour's Albums CBC Radio, Volume II"
"For half a century CBC radio listeners tuned in to CLYDE GILMOUR, first as a movie critic and then for over forty years as the gentle and enthusiastic host of Gilmour's Albums, the longest running network radio music show in CBC history. His final broadcast was in June 1997. All the music he played, from opera to comedy, was from his own private collection." 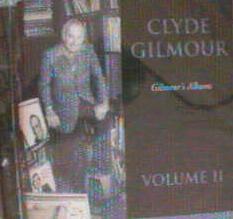 "...the Clyde Gilmour Collection... was donated to the CBC shortly after Mr. Gilmour's death in November 1997. Clyde Gilmour was a legendary broadcaster, writer and music collector who worked at CBC for more than 50 years. He was best known for the radio program "Gilmour's Albums," which ran from 1956 to 1997. The Gilmour collection consists of more than 10,000 long-play records... 4,000 CDs, program scripts, notes, correspondence, files, tapes and reference materials. It is housed in a corner of the Music Library, set up to look like his basement home office (complete with Mr. Gilmour's desk and old telephone). Clyde Gilmour's music collection is still used by CBC producers for programming.